Here is a video of one of the most well-known problems at Flagstaff, Smith Overhang. I remember seeing grainy black-and white-photos of Pat Ament on this problem in the book of Colorado climbing history Climb! 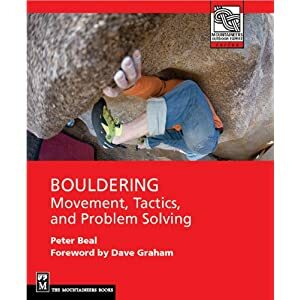 According to the Ament bouldering guide, A Climber's Playground, Richard Smith did the problem first in 1967. Little did I know until I saw the whole sequence that one started off a cheatstone to reach the flake. Now thanks to erosion of both the ground and the flake, you would need a pretty good-sized boulder to start there. The modern start is off two bad sidepulls below the undercling flake. In the video, I am standing on two fairly thin pads to reach the first holds. Although the landing is reasonably flat, pad the problem well as falls can be sudden and awkward.